There are 208 posts in this topic. You are on page 4 of 5. Could have sold this to me ages ago but you wouldn't budge off your 4500 dollar price. I might have known you would be out there trolling. How about you give it a rest and move on with life. For the record, I didn't budge on the price for several reasons...most of which revolved around posts you made here and on other social media, slamming the asking price and "mods". That and then you wanted me to deliver it to your door in KC. Had you approached it differently, you might have bought it ages ago as well. It's what happens when your typing hand out thinks your brain. I might have known you would be out there trolling. How about you give it a rest and move on with life. For the record, I didn't budge on the price for several reasons...most of which revolved around posts you made here and on other social media, slamming the asking price and "mods". That and then you wanted me to deliver it to your door. Had you approached it differently, you might have bought it ages ago as well. It's what happens when your typing hand out thinks your brain. Slamming the asking price? I said what they sold for, and funny story yours has been up for months without selling. Not the only one who was interested either and you were steadfast on your price. Do not act like you wouldn't come down on my account I know a few others you rebuked as well thinking you had gold. 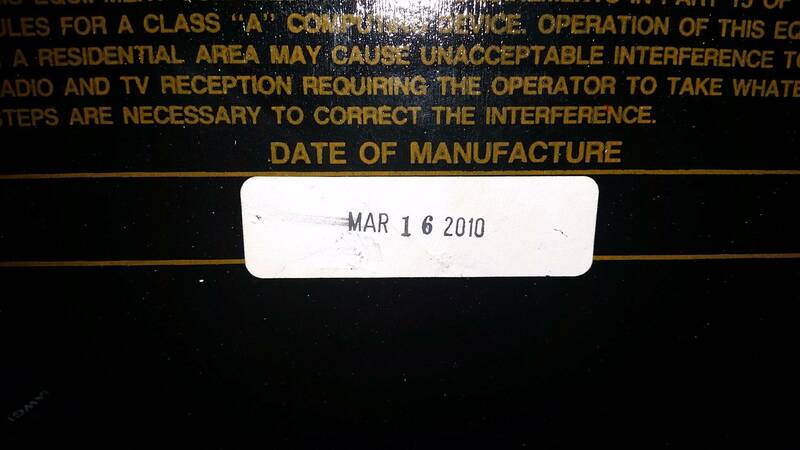 For the record, buying a toy and sitting it on top of a machine does not add value to it. End of the day, its all good. 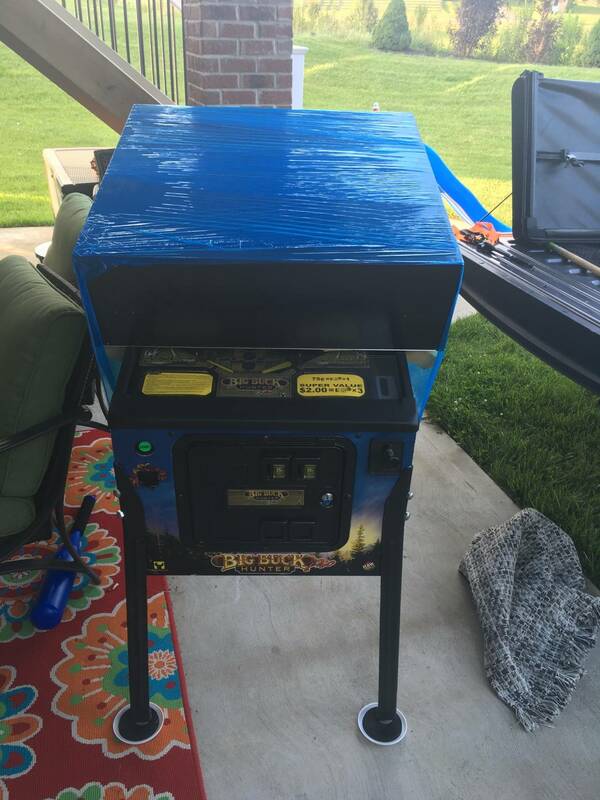 Found a very nice reasonable seller with a machine I was after. Maybe now you will find a buyer, best of luck with it. You said a lot more than that. And end of the day I will sell it at some point, for a price the buyer and I agree on. Should be no skin off your back since you passed on the price, and I wasn't begging you to buy it, or comment for that matter. Glad you found something you wanted...now go play. I joined the club a little over a month ago, just recently had more time to play it and have been getting better and better scores. put up 45 million the other night. The left outlane drain is brutal sometimes. Took me a while to get the Buck adjusted nicely. Had it apart about 3 times a week or two ago making tiny adjustments and now it registers hits just right. 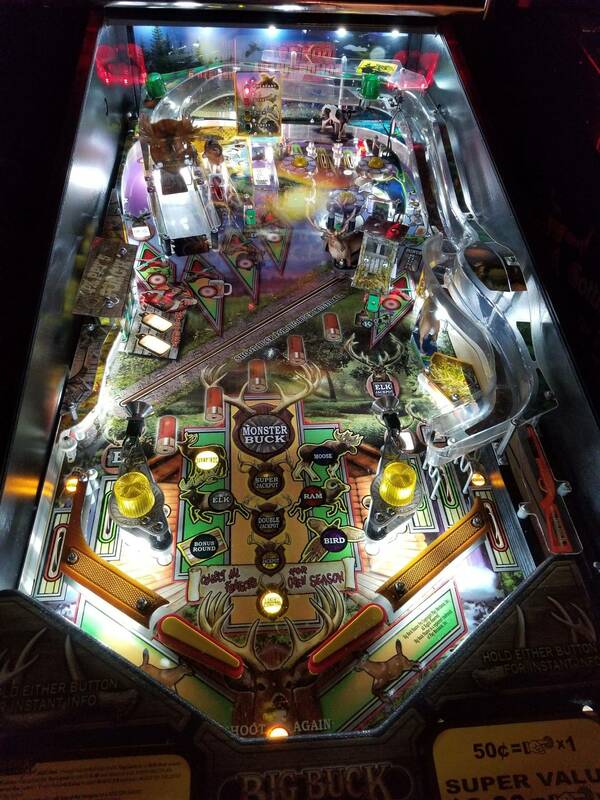 Found it was way too sensitive before and Buck Multiball would start with no effort, sometimes it would just register phantom hits, and i was ready to part ways with the game pretty quickly when it was acting that way, but now that i feel like its dialed in nicely, its been a blast to play! my buddy and I filmed a few games the other night, and also went through the play field features. 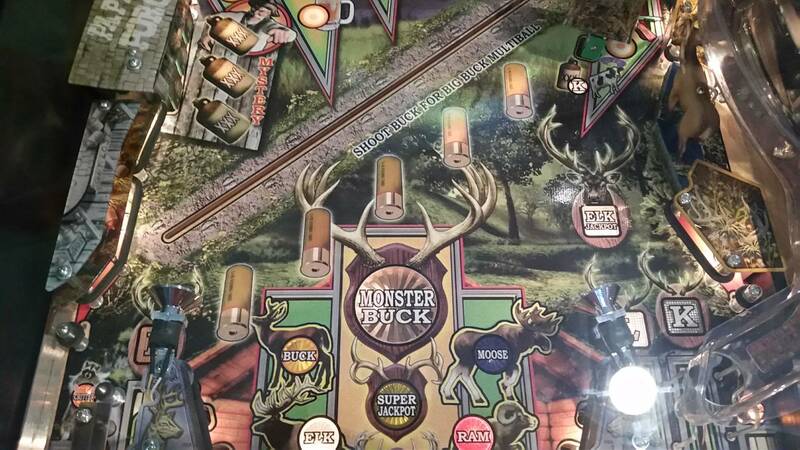 During Elk multiball on my BBH it takes a very hard hit to score an Elk jackpot. I've adjusted the EOS switch to have as small of a gap as I can get. I've seen video of others that don't take near as strong a hit as mine does. I think the coil might have been replaced with one that is stronger. 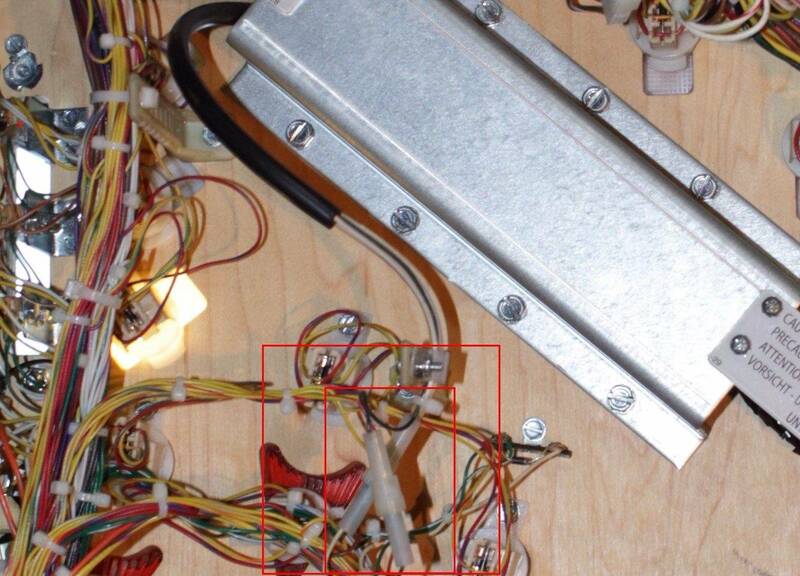 I downloaded the manual from Stern's web site but I don't see the coil in the manual. Can someone take a look at their coil and let me know what number it is? Thanks in advance for your help. Bump for help. Thank you. Do a switch test first and cross reference with the manual to double check it is set up as should be. ELK is a flipper mechanism from memory and you should also be able to test the coil via portal menu as well. The coil reference will be in there Dude, have another look. I doubt the coil will be the reason the switch isn't actuated. It is working fine. It just takes a very hard hit to get it to move. I have tried moving it by hand and it's very hard. I just think someone put in too strong of a coil. Are your wires soldered correctly to the correct lugs? I didn't get any response here on the coil number so I started another thread and got a response there on the number. A big thank you to CaryCarmichael for telling me the number. Someone did install the wrong coil as I suspected. But thank you for the suggestions. That's great news! If you want it super sensitive, remove the Elk. That extra weight on top of the flipper makes a huge difference. Does anybody have any recommendations on shooter lane protectors for this game?, specifically for the eject area out of the trough? I see the protector for the wall on the right side for sale in a few places. Doesn't seem to be a specific cliffy for this one for the eject spot, but wonder if there are ones from any other game that might work here? the was a weird knot in the wood on my game in that area and the ball ejecting has broken it down a bit over the years, would like to cover it up with a protector, rather than getting messy with wood filler or bondo. Most importantly, I put on several coats of Hard-As-Nails in the shooter lane after cleaning out all the dirt which helps harden it further and keep it clean. From the factory the shooter lane has a lot of exposed porous wood without enough clear, so it acts like a dirt sponge, so I like to generously apply, effectively, more clear coat to eliminate future dirt accumulation in the wood. Or just wait for the elk to break off. Hey, can anyone point me in the right direction. 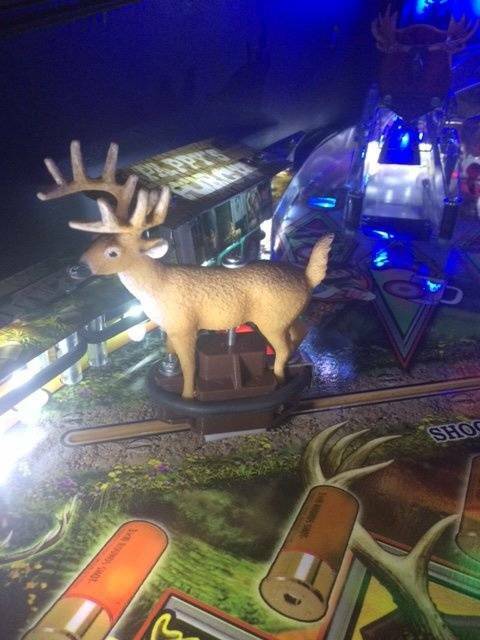 I'm having an issue with the Buck on my game. I had it tuned so it registered almost perfectly as per the thread on adjusting the sensitivity. 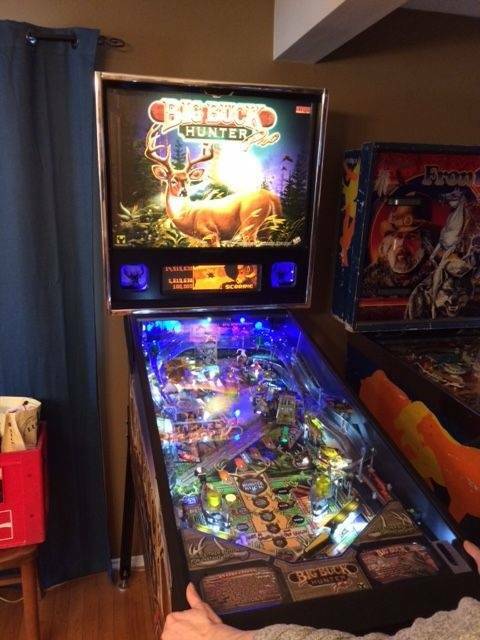 I moved the machine into my basement this previous weekend and now the Buck isn't registering at all. I took it apart to tune it up again, but it still won't register at all. Not hits, regardless of position. I did a switch test and moved the Buck manually with the glass off, but still no hit registered. I tested a few other switches and no issues with anything else. I think it is possible I may have jarred something loose while moving it downstairs, like a connector? Any advice on where to look to fix that? Hey Noah, I still had some pictures of under the playfield from when i took pictures of that game. One area i would check to rule it out is here in this picture where i have highlighted, theres a couple of single circuit wires spliced in... I don't know that this is stock, or maybe it is a repair. might be a good place to start, just make sure they are still connected, or that the connectors don't need to be recrimped. I never had issues with those in the game, but i always thought they looked out of place compared to how everything else in the game is connected. Let me know how it goes. Resolved. This was the issue for reference if anyone else comes across this. Happy Hunting! I am thinking about getting a BBH. There is a nice one for sale HUO. Seems a good deal. Just wonder what to look for in terms of known issues with the machine. I actually never played any but think this theme would be a great addition to my collection as these are not that common in collections. SO how are these holding up on quality and gameplay? It is a good game. The shots are satisfying and the multi balls are fun. The game has some humor which is a nice change of pace from other machines. Adjusting the sensitivity on the buck toy is a bit annoying but it is manageable. Also, the mechanism he moves on is a bit loud but that is normal. I think overall it is a solid game, probably a bit under appreciated due to the theme but it is really fun and has some decent charm. Just joined the club today. just started cleaning and waxing, this game is a lot more fun then i first thought!!!! Multi Balls are fun, especially if you have a shaker motor! Isn't meant to come with centre post, but hey, its yours and if you like it who cares.
" you got yourself a critter "
Perhaps the UK version, I've played Elvis versions with extra flipper buttons, a center uppost and outlane up posts. 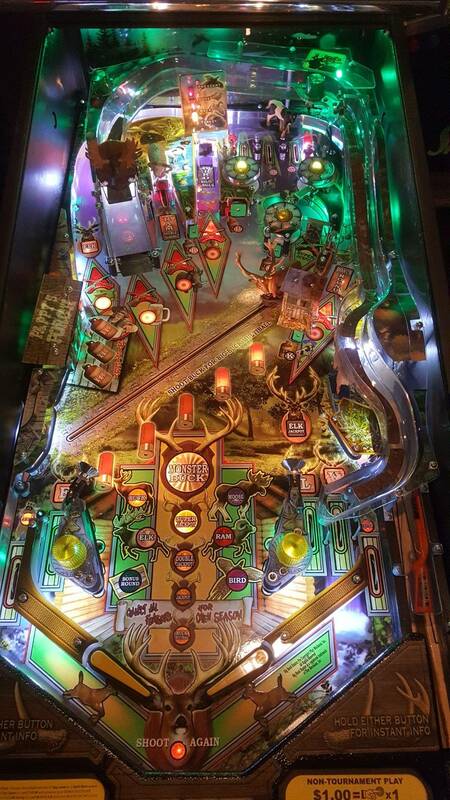 I'm troubleshooting a big buck hunter where the Bird and Ram opto switches are stuck closed in test. I have replaced the optos. I have replaced the opto amplifier board. All of the other switches in that row work fine. I have not tested the other switches in the Ram or Bird opto column. As soon as I plug in the 5 pin connector on the opto amplifier board, the switches are stuck closed in test. As soon as I plug in the switch drive connector at J1 in the backbox, the switches are stuck closed in test. The opto switches are not glowing red at any point. Is it likely a transistor for those switches? Anyone know which transistor it is? The BBH manual is not the best. Yes, and I’ve rewired the connector. Joined the club yesterday. Found a nice HUO copy that just needed a good shop and some LEDs. needs some insert LEDs butbI am super happy with it. So I don't know if I am the only one...but it has always bugged me that the "Buck" in BBH is actually an Elk bull, not a whitetail buck. I finally found a suitable replacement! Slightly smaller, but he fits in there really well! Easy switch, and if I want to go back its no problem. 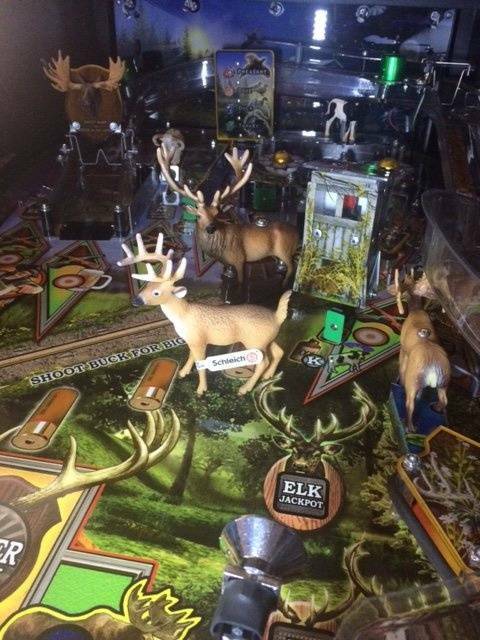 I am storing the bull elk in the upper left hand corner of the playfield, right above the Elk left orbit, where he fits perfectly! It looks like he is hiding in the woods. Has anyone else switched him out?? We don't have them in Australia so I never noticed and I personally like the original better. Does your version have googly eyes on it? If so, that is bloody funny and could imagine them going hay wire when you smash it. No googly eyes...just a real nice ten point white tail BUCK! 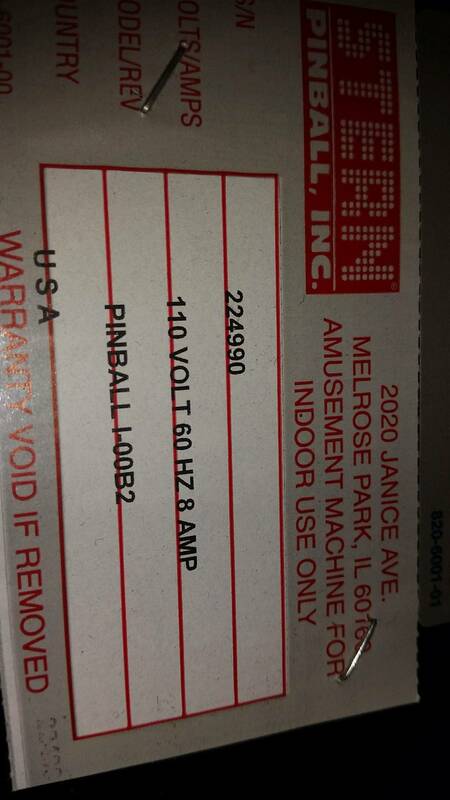 The Pinball Arcade has just announced that our pinball is due for release on virtual scene shortly. People will then understand the love for " You got yourself a critter"
I sold my BBH last year, but I get the itch to play it again every now and then. 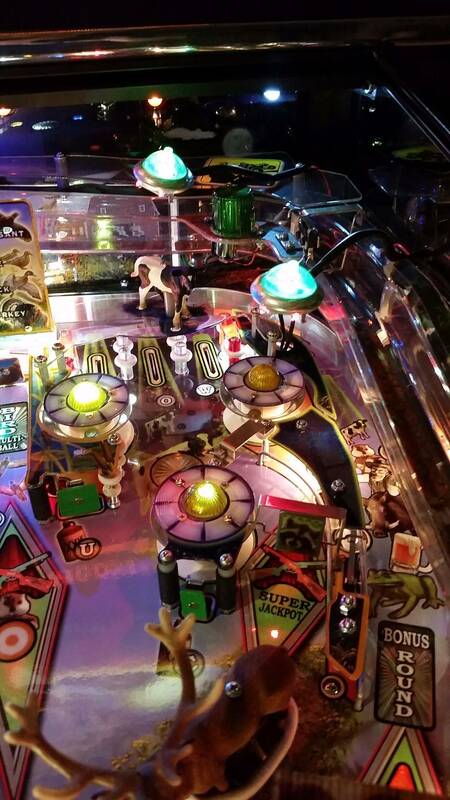 The Pinball Arcade release makes me happy. Installing service rails and have the rails screw holes over the dimes. For anyone who has done this, does it look correct? They released it for the Pinball Arcade? When did that happen? Id recommend you check connections, as well as menu settings. Ive had my settings set to disabled twice, on its own....Worked on it for hours until that was noticed. Has anyone else had a problem with their elk falling off? It's happened to me 3 times in the 3 years I've owned it. I've also seen them missing on location. 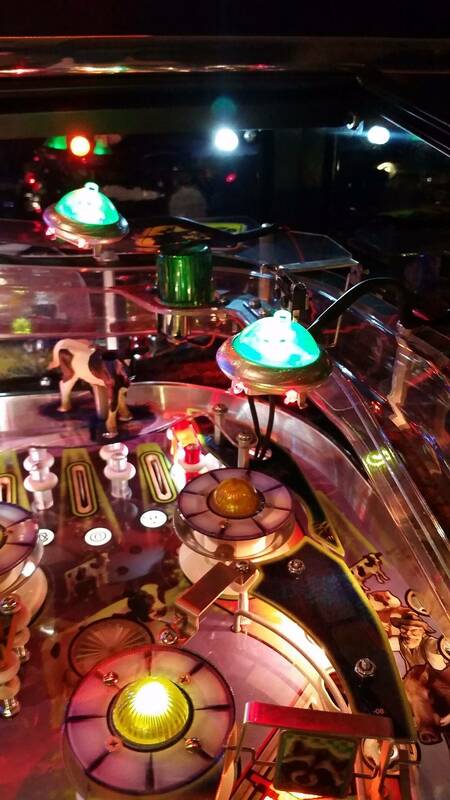 It looks like a terrible design, considering how violently it whips out during multiball. Anyone have any ideas on how to reinforce it so it stops happening? Never had the Elk fall off. 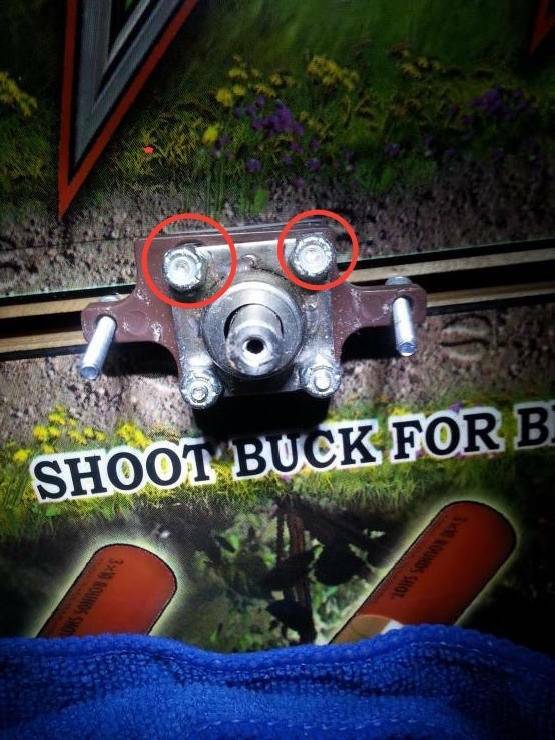 I have had a ton of issues with the moving Buck target. 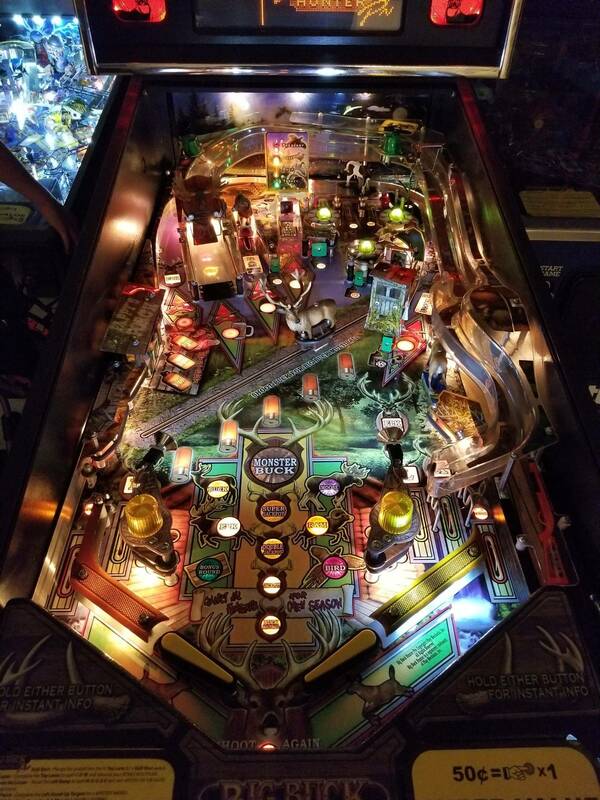 It's sensitivity is screwy and can't be adjusted (I'm guessing a break in the wire, so I need to rewire it now) and lately I've noticed it was scratching the playfield on the back part. 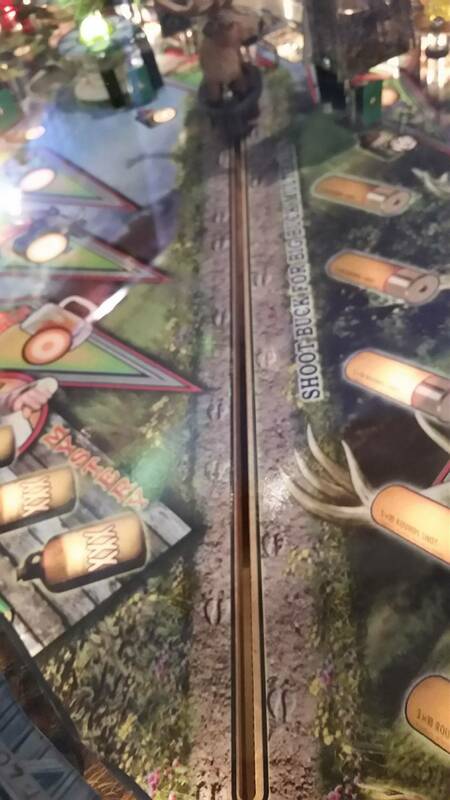 When I get a super jackpot, the light on the playfield doesn’t come on as if completed. ? What am I doing wrong? I know the bulb works in attract mode. Hey, not sure if you were citing that thread to show me or for some other reason. The previous owner did exactly what that thread said and so did I. 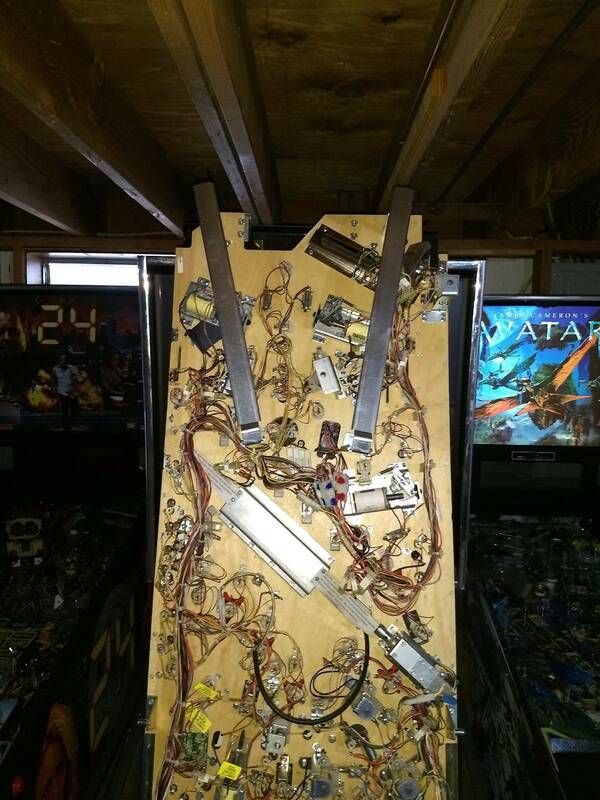 Seemed to work-ish for a while, but now the plastic is scraping the playfield. I'd love to figure out how to fix it. It's super annoying to have the game down for so long over something that shouldn't be so damn hard to fix. Not sure how to help you otherwise. This thread seems dead... as evidenced by my rules question above that got no replies.